Last week, the Texas State Senate passed redistricting plan C141. The plan adds four new seats, which were allocated to Texas based on the 2010 census. This memo presents results using standard methods for assessing the likely partisan consequences of plans. We map past election results into the current districts in order to calculate what percent of seats are majority Republican and what percent of seats are majority Democrat. We further consider the possibility of uniform shifts in the statewide vote, either in the direction of Democrats or Republicans, to assess the likely affects of the plan on the division of seats in future elections. Of particular interest is the projected division of seats in the hypothetical case when the statewide vote is divided evenly between the parties. This value is called the “partisan bias” of the districting plan (see Browning and King 1987). 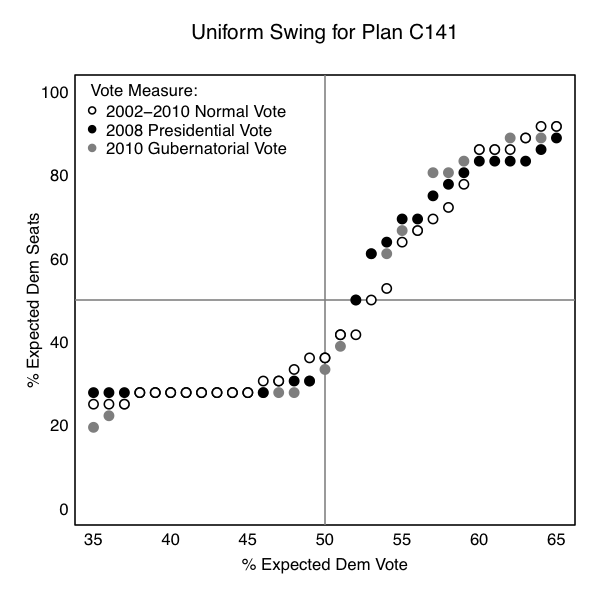 We generated three different uniform swing curves using different estimates for the Democratic share of the vote. First, we used a normal vote, which is the mean of the Democratic vote in each voting tabulation district (VTD) for all contested elections between 2002 and 2010. Second, we used the 2008 Presidential vote. Third, we used the 2010 gubernatorial vote.